Crumble the paneer in a mixing bowl with hands or grate it. Mix salt, chili powder, amchoor and chopped onions. Chop the coriander leaves finely and mix. Wash the bhavnagari chilies and pat them dry. Slit them lengthwise from stem to tip keeping the chilies 1 piece. Scoop out the seeds and fibers using a spoon. Fill in the paneer mix in the chilies. Heat butter/oil in a nonstick flat pan. Arrange the stuffed chilies one by one in 1 layer. Cover and cook on low flame for 5 minutes or until the lower side turns brown and crisp. Turn the chilies upside down and roast for 3-4 more minutes until the lower side turns brown. 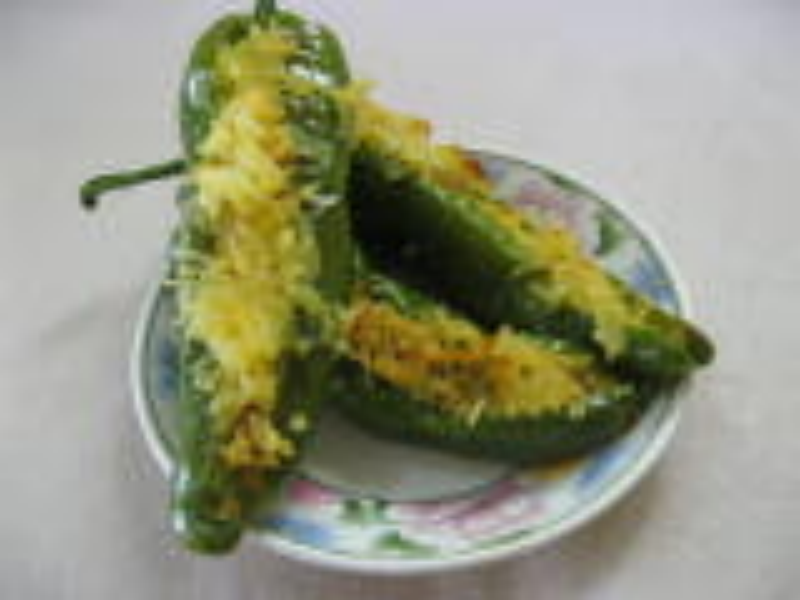 Arrange the chilies in an ovenproof dish and and top with grated cheese. Grill them for 3 minutes until the cheese turns brown. Relish with tea/coffee or as a side dish. If the chilies are big and its difficult to keep the filling intact, wrap around a clean thread onto the chilies, 3-4 rounds would be enough. This will not let the mixing come out and you can easily turn the chilies. Before you top them with cheese, delicately remove the thread. You can skip step # 12 and 13 if you don’t want to top with cheese.